The dust has settled from last weekend’s discussions — the most significant since the dispute over Iran’s nuclear programme escalated in 2003 — between the Islamic Republic and the 5+1 Powers. So amid the optimism from those supporting an agreement, the criticism from those opposing it, and the abundance of speculation, what can we establish from the talks in Geneva? The last-minute objections from France, blocking the signature of an initial deal, should not obscure the major advance towards a resolution. Before arrival in Geneva, the brightest projection — coming from the Rouhani Government — was that an initial deal could be reached within 3 to 6 months. In fact, it almost came within 72 hours. The break-through was not in the general proposal. Iran has long been offering a suspension of enrichment of uranium to 20%, with conversion of existing stock to remove any potential for military use, in return for a guaranteed supply of the fuel for civilian purposes. Tehran has said that, in return for recognition of its right to enrich, it would limit the process to 5% uranium. It has said that it would pursue inspection and supervision arrangements with the International Atomic Energy Agency. The devil was in the detail, or rather the refusal of the US and its European allies to believe that the detail could be arranged. Issues such as the location of the existing 20% stock, the status of the Fordoo enrichment plant, the number of centrifuges that Iran could operate — even if only for 5% uranium — and the scope of inspections were all put up as obstacles. Rather than taking down those obstacles, the US maintained the simplicity of its “Stop, Shut, and Ship” demand for the halt to 20% enrichment, the closure of the Fordoo plant, and the shipment of the stock outside Iran. And Washington never offered significant easing of sanctions. So what changed to bring the 5+1 and Tehran so close, so suddenly to a general agreement? Two shifts: a change of Iranian style and of American substance. The Rouhani Government did not bring a major adjustment to Iranian proposals which have been made since summer 2012. However, it presented those proposals with the smile of engagement. Foreign Minister Mohammad Javad Zarif, given authority by President Rouhani — and by the Supreme Leader — to conduct negotiations, was a bright contrast to his predecessor, the hard-line Saeed Jalili. At the conference table, in informal dialogue with other diplomats, and in numerous press appearances, he exuded patience, reasonableness, and even some cheer. In Tehran, Rouhani maintained a firm line on Iran’s core demands, thus ensuring the continued backing of Ayatollah Khamenei, and staved off any hard-line sabotage of the discussions. Meanwhile, the US was facing not only a more amenable Tehran but also some concern from Britain and Germany at the lack of movement in the talks, not only blocking a nuclear deal but adding to an unsettled Middle East. Last month’s resumption of negotiations in Geneva opened up the possibility of productive discussions, and technical discussions in Vienna at the start of November confirmed that the detail was not beyond resolution. So the Americans came ready to deal last week. Within hours, talks had advanced to intense bilateral discussions between the Iranians and other members of the 5+1, including the US, and journalists were told that US Secretary of State John Kerry — who had met Zarif in September —- would be coming to Geneva. While almost all delegations have maintained confidentiality, the outline of a deal can be traced. There will be an initial period of six months to test the arrangement: Iran will suspend 20% enrichment, effectively halting production at the Fordoo plant, and convert stock to fuel plates. Meanwhile, discussions over the number of centrifuges that Tehran can use for 5% enrichment will try to reach a conclusion. Parallel talks with the International Atomic Energy Agency will define inspection and supervision arrangements, with the possibility — if all else goes well — that Tehran will observe the Additional Protocols of the Non-Proliferation Treaty. Iran’s right to enrich will thus be implicitly recognized, even if the US does not risk public acknowledgement at this point. No hints have been given about the sanctions relief, but look for it to come from the European Union — which has far more leeway than an Obama Administration having to deal with Congress — with a pull-back of restrictions on insurance, shipping, and financial transactions. 2. SO WHY DID FRANCE BLOCK AN AGREEMENT? For all the surprise of the quick move towards a deal, the bigger shock was that France spoiled the party. On Saturday morning, as the Foreign Ministers gathered to conclude discussions and sign an initial agreement, France’s Laurent Fabius declared his wariness of a “game of fools”. Even more damaging, Fabius broke the pledge of confidentiality and told journalists that France had two concerns: the arrangements for the suspension of 20% enrichment, with the continuation of the process for 5% uranium, and for the construction of the Arak heavy-water nuclear reactor. Unless Fabius had further information that he was not leaking, neither of those objections would necessarily have blocked a general deal at Geneva. With Iran’s commitment to suspend 20% production, the details for the 5% process and the number of centrifuges could be concluded by the technical experts. And Arak — which was not even an issue at the table for the 5+1 Powers in high-level talks this spring — was far from an imminent challenge, given that it is not scheduled for operation until late 2014. Instead, the French Foreign Minister was throwing up a political road-block. If the deal went ahead, it would do so with a divided 5+1. 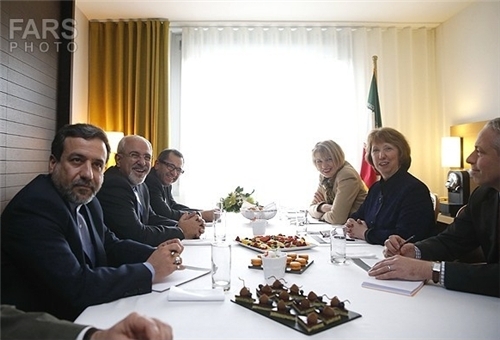 Kerry, Zarif, and the European Union’s Catherine Ashton tried to find some form of words to remove Paris’ challenge, but could not succeed in five hours of talks on Saturday night. Take your pick of the reasons put forward for France’s sudden objection: a harder line in policy towards Iran, begun in the Sarkozy Administration and continuing under President Hollande; alliance with Israel’s opposition, with Hollande soon visiting West Jerusalem; links with Saudi Arabia, including current discussion of major arms deals; frustration with the US retreat from support of the insurgency in Syria. Whatever your choice, the question remains: does this objection turns into a more substantial undermining of the process for a deal? Recognizing the need to maintain momentum, Iran and the rest of the 5+1 Powers agreed to re-convene on November 20. That gives the opponents of a settlement nine days to mobilize their forces. Israeli Prime Minister Netanyahu was already operating at full speed: he warned Kerry, who left Israel for Geneva, that a “bad deal was worse than no deal”. When that deal took shape, he put out even stronger objections through Israeli media. And on Sunday, he took his case to the American public, with an appearance on US television and a speech warning that Iranian ICBMs could soon hit American soil. However, far more striking was the inability of President Obama’s domestic opponents to mobilize during Geneva. Senators who said they would strengthen sanctions on Iran could not get political traction. No wave of “scare stories” about an imminent Tehran bomb materialised. Nor, despite the chatter about Saudi fear of a deal, was there any sign of a blocking move from America’s Gulf allies. Of course, none of this means that such opposition might not surge this week. It was notable that, as soon as Geneva ended, the US delegation was on the road to forestall that possibility, with Kerry going to the UAE and lead American negotiatior Wendy Sherman leading a mission to Israel. But the political context is far different now than it was even two months ago. The US hard-liners and their allies cannot count on help from Iranian statements denouncing Washington and a nuclear bargain: the Rouhani Government has effectively mobilized support from almost all elements in the regime, including the Supreme Leader, for engagement. And, having suddenly so far up the hill to a deal, the Obama Administration has made it less likely that it fall back down. The 60 hours in Geneva proved that any prediction could suddenly be swept away. However, having been cautious up to last Thursday about the prospects for an agreement, I would now place my analyst’s chips on success, at least for a historic first-phase deal.